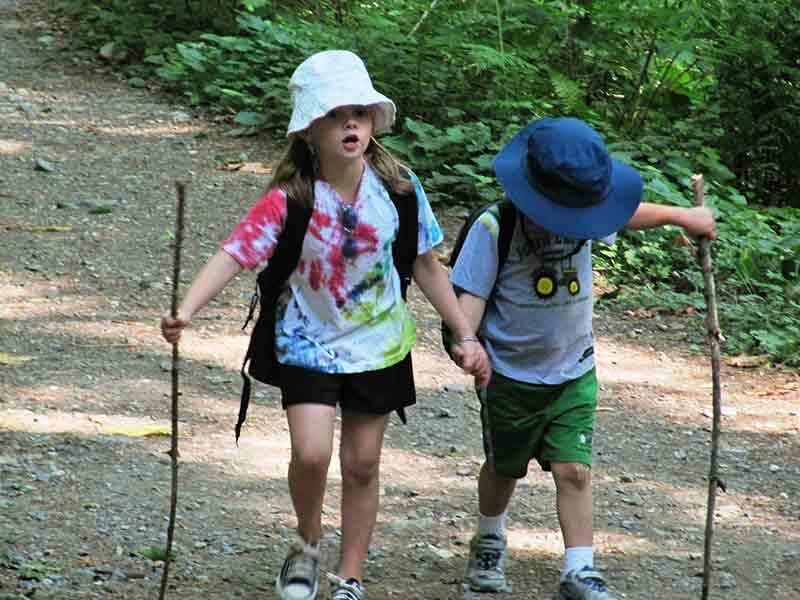 When you have a child with any kind of special need it can be intimidating to think about taking them to the great outdoors. You wonder and worry about all the possible nightmares that could come from such an endeavor. Will your child meltdown in the middle of the forest? Will they simply stop walking and refuse to go any further? What will we do if we take the wrong path? Children with Autism in particular can have difficulties with changes to the plans regardless what they are. A few years ago I’ve foolishly surprised my children with a trip to the swimming pool which resulted in tears from both of them. Heading down a different trail in the forest than I might have promised is a risky thing and I figured I better know what I’m doing ahead of time so that all three of us don’t end up in tears. Even if I had no idea what I was doing I needed them to believe I had it all under control. All the possible hiccups and the uncertainty kept me from sharing a part of life that I loved. I had never done a lot of hiking but I loved nature. I grew up riding my bike through the provincial park a few blocks from my house. Every summer we’d drive to the mountains and find a new lake to picnic at. This was where my mind was quiet and I could enjoy the pleasure of simply existing but with both of my children having Autism I struggled to imagine carrying on this tradition. Raising one child on the spectrum can be challenge enough but with two I was doubly afraid of the ‘what ifs’. If things were going to go wrong I imagined that it would be epic and in this case epic wasn’t good. Last summer was about the fourth year in a row that I had cautiously considered taking a trip to the mountains with my children. I knew how much good could come of it. There really is nothing quite like feeling the wind blow through the valley, feeling it blow through your hair, smelling the fresh scent of wild flowers and pine trees. As a child I had seen bears from a distance, moose, deer, and all kinds of birds. We are blessed to be close to Banff National Park which should be a must see on everyone’s bucket list. My children and I had taken short day trips out there with varying degrees of success and I wasn’t sure if they would have the same great memories I did as a child. This summer I finally decided to jump in with both feet. I think it was a mix of courage and stupidity that pushed me to do it. It would be what it would be. Of course it helped that my children were a little older now and we were past most of the meltdowns of the earlier years. Thankfully once I decided an opportunity to take my kids out to the mountains presented itself and so I went for it. We are fortunate enough to have a mountain resort specifically for people with disabilities about an hour and a half from our home nestled close to Banff. It was a scary thing but I knew I needed to try. After all my children were getting older and I knew “some day” had to be now. We booked ourselves for a week. Luckily the cabins are deep enough into the woods that there is no internet connection and not even television. This was the perfect excuse to get out and do a hike every day. Now because we are not experienced hikers I wanted to make sure we started out conservatively. We found popular trails where we would be sure to run into other people. There were also nature classes being taught at a nearby campground and we took the Bear Aware class so we’d minimize the chances of running into any large furry wildlife. Having two children on the Autism spectrum means two times the planning and two times the suitcases. I’m sure we looked ridiculous carrying that much in and out of our cabin. However I was determined that we’d have everything we might possibly need so that our week would go as smoothly as possible. Both my children are very different little people. One loves nature and the other might as well be allergic to fresh air. As the week progressed and we started trying longer walks something really amazing started to happen. Although my reluctant hiker was preoccupied with running into bears on our trips he did start to enjoy it. The kid who I was convinced would complain the entire trip was enjoying himself completely. He even told anyone who would listen that our hikes had made his muscles stronger. Complete strangers would smile politely and then keep on walking. Finding wild raspberries nearly every day might have had something to do with his motivation too. It also helped that he had a little sister to outdo and maybe even something to prove to himself. By the last day the children were taking photos of interesting plants and animal tracks they had found with the hope of taking it back to our local park wardens for help identifying. We were making memories and not just horrible ones, these were amazing, joyful memories and not one of them had anything to do with video games or the internet. The kids are looking forward to go back again this summer. After all the fretting that our trip would go down in the history books as epic for the wrong reasons we ended up with a week’s worth of wonderful memories instead. In the words of my son “That was epic Mom”. What more can I say?